Audrey J. Weiss, Ph.D., Anne Elixhauser, Ph.D., and Roxanne M. Andrews, Ph.D. This Statistical Brief presents data from the Healthcare Cost and Utilization Project (HCUP) on characteristics of OR procedures in 2011. For this Statistical Brief, OR procedures are defined using the HCUP procedure classes tool.5 In this tool, OR procedures are identified based on diagnosis-related groups (DRGs) that use physician panels to determine whether the procedure would be performed in a hospital OR in most hospitals. The findings in this Statistical Brief represent an update to 2007 statistics reported by Elixhauser and Andrews. 6 Patient characteristics, resource use, and outcomes are provided for stays with and without OR procedures. The most frequent and most costly OR procedures also are presented. All differences between estimates noted in the text are significant at the .0001 level or better. In 2011, a total of 38.6 million hospital stays occurred in the United States at an aggregate cost of $387.2 billion. Of these, just over one-fourth of the stays (28.9 percent) and nearly half of the costs (47.9 percent) involved hospitalizations during which OR procedures were performed (Figure 1). In 2011, hospitalizations that involved operating room (OR) procedures constituted 29 percent of the total 38.6 million hospital stays in the United States and 48 percent of the total $387 billion in hospital costs. Hospital stays that involved an OR procedure were about twice as costly as stays that did not involve an OR procedure. Compared with hospital stays that did not include an OR procedure, stays involving an OR procedure resulted in a longer length of stay, were more likely to be elective admissions, and were less likely to involve major or extreme severity of illness. Stays billed to Medicare and Medicaid together accounted for 63 percent of aggregate hospital costs in 2011. Hospital stays involving OR procedures were about half as likely to result in patient death as were stays without an OR procedure. The 20 most common procedures accounted for more than half of all OR procedures. Cesarean section and circumcision were the most frequent OR procedures. Musculoskeletal procedures and cardiac procedures also accounted for a substantial portion of the most common OR procedures. Twenty procedures accounted for more than half of all costs for stays involving OR procedures. Spinal fusion, knee arthroplasty, and percutaneous coronary angioplasty (PTCA) were the procedures with the highest aggregate hospital costs. Figure 1. Percentage of inpatient discharges and aggregate costs for hospital stays with and without operating room (OR) procedures in U.S. hospitals, 2011. 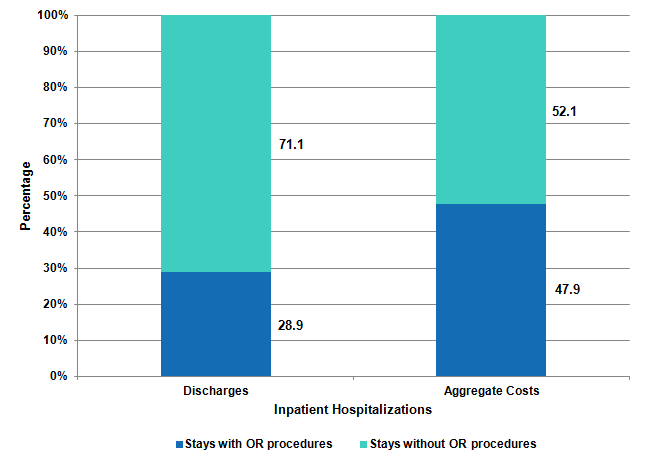 This figure is a stacked bar chart showing the percentage of discharges and aggregate costs by the type of inpatient hospitalization. Discharges: Stays with OR procedures, 28.9%, Stays without OR procedures, 71.1%. Aggregate Costs: Stays with OR procedures, 47.9%, Stays without OR procedures, 52.1%. Source: Agency for Healthcare Research and Quality (AHRQ), Center for Delivery, Organization, and Markets, Healthcare Cost and Utilization Project (HCUP), Nationwide Inpatient Sample (NIS), 2011. Table 1 presents the patient characteristics for hospital stays with and without OR procedures. The vast majority of these hospital stays occurred among adults aged 20-84 years (81.3% of stays involving OR procedures and 73.1% of stays without OR procedures). Children (aged 0-19 years) and the elderly (aged 85 years and older) were less likely to undergo OR procedures. Females accounted for just over half of hospital stays, with and without an OR procedure. Among hospital stays involving an OR procedure, the most common expected primary payers were private insurance (41.3 percent of stays) and Medicare (34.0 percent). For hospital stays that did not involve an OR procedure, Medicare was the most common primary payer (42.1 percent of stays). * The vast majority of hospital stays with OR procedures among infants (aged <1 year) involved circumcision. Overall, hospital stays with OR procedures accounted for $185 billion and stays without OR procedures accounted for $202 billion (Table 2). Hospital stays with OR procedures were twice as expensive as hospital stays without OR procedures in total costs (mean cost of $16,700 versus $7,400 per stay) and cost per day ($3,300 versus $1,700). * OR procedures included birth-related procedures such as Cesarean section and circumcision. Hospital stays involving an OR procedure were longer than stays that did not involve an OR procedure (5.0 versus 4.4 days). Elective hospital admission was more frequent for stays that involved an OR procedure (48.5 percent) than for stays without an OR procedure (13.4 percent). Hospital stays with an OR procedure were less likely to involve major or extreme severity of illness compared with stays that did not involve an OR procedure (23.7 versus 34.7 percent of stays). Patients with an OR procedure were half as likely to die in the hospital compared with those who did not have an OR procedure (1.1 versus 2.2 percent). Table 3 provides the top 20 most frequent all-listed OR procedures. Together, these 20 procedures accounted for more than half (54.0 percent) of the 15.7 million OR procedures performed in 2011. Cesarean section and circumcision were the most common OR procedures, accounting for more than 8 percent and 7 percent of all OR procedures, respectively. Five musculoskeletal procedures—knee arthroplasty, laminectomy, spinal fusion, hip replacement, and treatment of hip or lower extremity fracture or dislocation—together accounted for about 17 percent of all OR procedures. Four cardiac procedures—percutaneous coronary angioplasty (PTCA), coronary artery bypass graft (CABG), cardiac device—related procedures, and heart valve procedures—together accounted for another 7 percent of all OR procedures. * Clinical Classifications Software (CCS), which groups procedures into clinical categories, was used in this analysis. Table 4 lists the top 20 OR procedures with the highest aggregate hospital costs for the entire hospital stay during which this procedure was first listed on the discharge record. Together, these 20 procedures accounted for more than half (57.5 percent) of all costs associated with stays involving OR procedures and more than one-fourth (26.8 percent) of all hospital costs for stays of any type. Six of the top 20 OR procedures with the highest aggregate hospital costs were musculoskeletal procedures: spinal fusion (7.1 percent of aggregate costs for stays with OR procedures), knee arthroplasty (6.3 percent), hip replacement (4.4 percent), treatment of hip fracture (2.4 percent), laminectomy (1.3 percent), and treatment of other lower extremity fracture (1.2 percent). Four heart-related procedures were among the top 20 OR procedures with the highest aggregate costs: PTCA (5.4 percent of costs for stays with OR procedures), CABG (3.6 percent), heart valve procedures (3.4 percent), and pacemaker/cardioverter/defibrillator procedures (2.2 percent). Among the 20 OR procedures with the highest aggregate hospital costs, heart valve procedures and CABG had the highest mean costs per hospital stay ($53,400 and $38,700, respectively). Two childbirth and delivery-related procedures (Cesarean section and circumcision) were also in the top 20 OR procedures with the highest aggregate costs, accounting for 4.1 percent and 1.0 percent of costs for stays with OR procedures. Four gastrointestinal procedures were in the top 20: colorectal resection (3.7 percent of aggregate inpatient costs for stays with OR procedures), cholecystectomy (2.8 percent), appendectomy (1.4 percent), and small bowel resection (1.3 percent). All-listed procedures include all procedures performed during the hospital stay, whether for definitive treatment or for diagnostic or exploratory purposes. The first-listed procedure is the procedure that is listed first on the discharge record. Inpatient data define this as the "principal procedure"—the procedure that is performed for definitive treatment rather than for diagnostic or exploratory purposes (i.e., the procedure that was necessary to take care of a complication). ICD-9-CM is the International Classification of Diseases, Ninth Revision, Clinical Modification, which assigns numeric codes to procedures. There are about 4,000 ICD-9-CM procedure codes. CCS categorizes procedure codes into clinically meaningful categories.8 This "clinical grouper" makes it easier to quickly understand patterns of procedure use. CCS categories identified as "Other" typically are not reported; these categories include miscellaneous, otherwise unclassifiable procedures that may be difficult to interpret as a group. In addition, procedure categories that are nonspecific or likely to be adjuncts to other procedures (e.g., excision, lysis peritoneal adhesions; partial bone excision; intraoperative cholangiogram) are not included in the listings of specific procedures in Tables 3 and 4. Major operating room (OR) procedures were defined using procedure classes, which categorize each ICD-9-CM procedure code as either major therapeutic, major diagnostic, minor therapeutic, or minor diagnostic.9 Major OR procedures are considered to be valid OR procedures based on diagnosis-related groups (DRGs). This classification scheme relies upon physician panels that classify ICD-9-CM procedure codes according to whether the procedure would be performed in a hospital operating room in most hospitals. Aggregate costs are calculated using aggregate charges. Aggregate charges include discharges with missing or invalid charges that are imputed by taking the mean charges for all discharges of the same diagnosis-related group (DRG) with nonmissing charges. Fewer than 2 percent of cases are missing charges in HCUP data. Mean costs are calculated using only discharges with nonmissing and valid charges. Because of the manner in which missing charges are imputed to calculate aggregate charges, simple calculation of the number of discharges multiplied by the mean cost will not always equal the aggregate costs. Cases with the highest severity of illness are discharges with a score of 3 or 4 on the All Patient Refined DRG (APR-DRG) severity of illness scale. The four severity of illness subclasses are numbered sequentially from 1 to 4 indicating minor, moderate, major, or extreme severity of illness. The determination of severity of illness is disease specific. Thus, the significance attributed to complicating or comorbid conditions is dependent on the underlying problem. For example, certain types of infections are considered a more significant problem in a patient who is immunosuppressed than in a patient with a fractured arm. In APR-DRGs, high severity of illness is primarily determined by the interaction of multiple diseases. Patients with multiple comorbid conditions involving multiple organ systems represent difficult-to-treat patients who tend to have poor outcomes. The assignment of a patient to a severity of illness subclass takes into consideration not only the level of the secondary diagnoses but also the interaction among secondary diagnoses, age, principal diagnosis, and the presence of certain operating room and nonoperating room procedures. Introduction to the HCUP Nationwide Inpatient Sample, 2009. Online. May 2011. U.S. Agency for Healthcare Research and Quality. http://hcup-us.ahrq.gov/db/nation/nis/NIS_2009_INTRODUCTION.pdf. Accessed November 21, 2013. Houchens R, Elixhauser A. Final Report on Calculating Nationwide Inpatient Sample (NIS) Variances, 2001. HCUP Methods Series Report #2003-2. Online. June 2005 (revised June 6, 2005). U.S. Agency for Healthcare Research and Quality. http://www.hcup-us.ahrq.gov/reports/methods/2003_02.pdf. Accessed November 21, 2013. Weiss AJ (Truven Health Analytics), Elixhauser A (AHRQ), Andrews RM (AHRQ). Characteristics of Operating Room Procedures in U.S. Hospitals, 2011. HCUP Statistical Brief #170. February 2014. Agency for Healthcare Research and Quality, Rockville, MD. http://www.hcup-us.ahrq.gov/reports/statbriefs/sb170-Operating-Room-Procedures-United-States-2011.pdf. The authors would like to acknowledge the contributions of Ed Hock of Social & Scientific Systems, Inc.
1 Elixhauser A, Andrews RM. Profile of inpatient operating room procedures in US hospitals in 2007. Arch Surg. December 2010;145(12):1201—8. 3 Cullen KA, Hall, MJ, Golosinskiy A. Ambulatory Surgery in the United States, 2006. National Health Statistics Reports #11. September 4, 2009. Center for Disease Control and Prevention, National Center for Health Statistics, Hyattsville, MD. http://www.cdc.gov/nchs/data/nhsr/nhsr011.pdf. Accessed November 21, 2013. 5 HCUP Procedure Classes. Healthcare Cost and Utilization Project (HCUP). U.S. Agency for Healthcare Research and Quality. Rockville, MD. Updated September 2013. http://www.hcup-us.ahrq.gov/toolssoftware/procedure/procedure.jsp. Accessed November 21, 2013. 6 Elixhauser A, Andrews RM. Profile of inpatient operating room procedures in US hospitals in 2007. Arch Surg. December 2010;145(12):1201—8. 7 Barrett M, Lopez-Gonzalez L, Coffey R, Levit K. Population Denominator Data for use with the HCUP Databases (Updated with 2012 Population data). HCUP Methods Series Report #2013-01. Online. March 8, 2013. U.S. Agency for Healthcare Research and Quality. http://www.hcup-us.ahrq.gov/reports/methods/2013_01.pdf. Accessed November 21, 2013. 8 HCUP Clinical Classifications Software (CCS). Healthcare Cost and Utilization Project (HCUP). U.S. Agency for Healthcare Research and Quality, Rockville, MD. Updated November 2013. http://www.hcup-us.ahrq.gov/toolssoftware/ccs/ccs.jsp. Accessed November 21, 2013. 9 HCUP Procedure Classes. Healthcare Cost and Utilization Project (HCUP). U.S. Agency for Healthcare Research and Quality. Rockville, MD. Updated September 2013. http://www.hcup-us.ahrq.gov/toolssoftware/procedure/procedure.jsp. Accessed November 21, 2013. 10 HCUP Cost-to-Charge Ratio Files (CCR). Healthcare Cost and Utilization Project (HCUP). 2001—2009. U.S. Agency for Healthcare Research and Quality, Rockville, MD. Updated September 2012. http://www.hcup-us.ahrq.gov/db/state/costtocharge.jsp. Accessed November 21, 2013. Internet Citation: Statistical Brief #170. Healthcare Cost and Utilization Project (HCUP). February 2014. Agency for Healthcare Research and Quality, Rockville, MD. www.hcup-us.ahrq.gov/reports/statbriefs/sb170-Operating-Room-Procedures-United-States-2011.jsp.